Premium Protein Blend (Whey Protein Isolate, Whey Protein Concentrate, Milk Protein Isolate), Isomalto-Oligosaccharides, Vegetable Glycerin, Vegetable Oils (Palm, Palm Kernel, and Soybean Oil), Soy Protein Isolate, Maltitol, Sugar, Birthday Cake Flavor-ettes (Sugar, Corn Syrup, Corn Cereal, Corn Starch, Hydrogenated Palm Oil, Natural Flavor, Artificial Flavor, FD&C Red No. 40, FD&C Blue No. 1, FD&C Yellow No. 5), Water, Mono and Diglycerides, Natural Flavors, Salt, Soy Lecithin, Potassium Sorbate, Citric Acid, Whey, Beta-Carotene (Color), Pink Drizzle Color [Palm Kernel Oil, Beet (Color), Rice Bran Extract, Annatto (Color), Turmeric (Color)], Vitamin A Palmitate, Almonds, Peanuts, and Sucralose. Premium Protein Blend (Whey Protein Isolate, Whey Protein Concentrate, Milk Protein Isolate), Isomalto-Oligosaccharides, Vegetable Glycerin, Vegetable Oils (Palm, Palm Kernel, and Soybean Oil), Soy Protein Isolate, Maltitol, Sugar, Water, Cocoa (Processed With Alkali), Mono and Diglycerides, Natural Flavors, Salt, Soy Lecithin, Citric Acid, Whey, Beta-Carotene, Vitamin A Palmitate, Potassium Sorbate, Tapioca Starch, Almonds, Peanuts, Sucralose. Premium Protein Blend (Whey Protein Isolate, Whey Protein Concentrate, Milk Protein Isolate), Isomalto-Oligosaccharides, Vegetable Glycerin, Soy Protein Isolate, Vegetable Oils (Palm, Palm Kernel, and Soybean Oil), Sugar, Water, Peanut Flour, Maltitol, Cocoa (Processed With Alkali), Mono and Diglycerides, Salt, Natural Flavors, Reduced Mineral Whey Powder, Soy Lecithin, Citric Acid, Whey, Beta-Carotene, Vitamin A Palmitate, Potassium Sorbate, Tapioca Starch, Almonds. Premium Protein Blend (Whey Protein Isolate, Whey Protein Concentrate, Milk Protein Isolate), Isomalto-Oligosaccharides, Vegetable Glycerin, Vegetable Oils (Palm, Palm Kernel, and Soybean Oil), Soy Protein Isolate, Sugar, Maltitol, Water, Cinnamon, Mono and Diglycerides, Natural Flavors, Salt, Soy Lecithin, Potassium Sorbate, Citric Acid, Whey, Beta-Carotene, Vitamin A Palmitate, Non-Fat Milk Solids, Whole Milk Solids, Almonds, Peanuts, Sucralose. Premium Protein Blend (Whey Protein Isolate [Milk], Whey Protein Concentrate [Milk], Milk Protein Isolate), Isomalto-Oligosaccharides, Vegetable Glycerin, Vegetable Oils (Palm, Palm Kernel, and Soybean Oil), Soy Protein Isolate, Maltitol, Sugar, Water, Tapioca Starch, Dextrose, Natural Flavors, Monoglycerides, Salt, Rice Flour, Citric Acid, Fruit and Vegetable Juice (Color), Soy Lecithin, Molasses, Whey [Milk], Beta-Carotene, Vitamin A Palmitate, Baking Soda, Caramel Color, Xanthan Gum, Potassium Sorbate, Malic Acid, Annatto, Almonds, Peanuts, Sucralose. 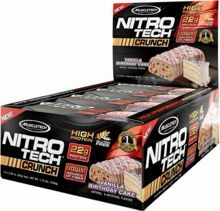 Our Nitro-Tech Crunch Bar REVIEW! Watch CJ and Robert tear into these Crunch Bars! The flavors were mostly great (minus peanut butter) but what's the deal with their weights?? Make sure you use a food scale if you're dieting! Available in 5 Amazing Flavors!